Seanbaby's Hostess Page - Captain America in "The Deciding Factor!" In this ad, the pie attack makes a lot of sense since the aliens have to take their head globes off to eat. I don't know if it was for the kids or what, but the Hostess people cut out the two panels where the aliens realized their helmets were gone and they choked to death on our atmosphere. Then Captain America and Nick Fury laughed and tugged their arms off. Those guys HATE people from outer space. To be honest, I don't really like pie enough to read crap like this. I think those aliens look like my cousins, though. But it's really hard to tell with all their clothes on. Forget I said that. You have a gun, Nick Fury. Use it. You don't pie toss when your friend is buried in aliens, fool. You start knockin' those suckas' heads together until their globe hats break. How you gonna explain to Captain America's friends when they ask what you did to the aliens that killed him? "I... uh... fed them." "You did what? Did you give them massages after that? I wasn't going to say this, but I hate your eyepatch!!!" 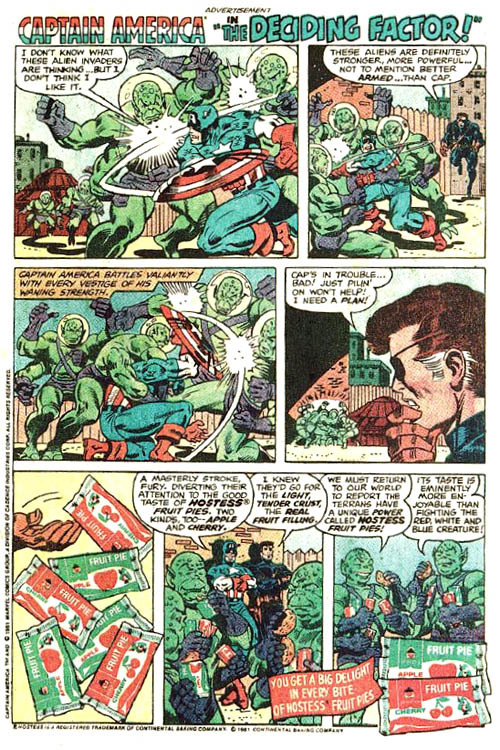 Doom has traveled the stars and encountered alien species incapable of logic or thought. He has witnessed civilizations based on banality, stupidity, and foolishness. But Doom has never seen creatures this laughably inept. Doom feels all four of their arms are a necessary adaptation to help pull their heads from their space asses. So deduces Doom's unmatchable hilarity!